Teenangels is WiredSafety's teen digital safety group. You can learn more about us at Teenangels.org or by visiting WiredSafety.org. We testify before the US Congress, present events to the UK Parliament, the FTC and the Governor of California, among others. We serve on MTV's advisory board, advise Procter & Gamble, Facebook, Microsoft and ToyrRUs, and act as experts for the media.Here we are speaking at the UN a few minutes after the head of the UN spoke! Itwas so terrific. One of us was 14 and the other 16. You've seen us on Dr. Phil, on the Today Show and MSNBC, with Diane Sawyer on Good Morning America and on Dateline and CNN. Want to join? Visit Teenangels.org. Want to arrange for us to speak at your event? Visit Teenangels.org's booking Teenangels for your school event section. On November 9th I attended a parent’s meeting at a middle school in Ossining. Beforehand, we were told that we would be speaking to a group of parents who were very concerned about the dangers of allowing their kids to go onto social networking websites. On the drive to Ossining, I looked over my speaker’s notes for the presentation. I practiced my methods of deep breathing so that I would be relaxed before presenting. We entered the school and set up our technical equipment on stage. After each of us looked over our notes more than once, the parents of children in the Ossining school system began to take their seats. We listened as the principal of the school stated her views on middle school students visiting social networking sites. She then introduced us and we took our place on stage. I could feel that sensation of excitement mixed with my nerves as I prepared to present at the podium. 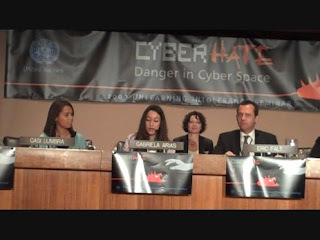 I presented a slideshow on cyberbullying and its effects. I also spoke of how parents should be involved in their children’s access to the Internet. As I spoke, a feeling of great importance swept over me. In that moment, I was teaching parents how to keep their children safe… how to potentially save millions of lives. Afterwards, I listened to a police officer speak about the dangers of MySpace. He began with a description MySpace, and then gave examples of the dangerous content that anyone can access and he even showed the crimes resulting from this social networking site. The detective’s words impacted me in many different ways and I could not stop thinking about the statistic- 54% of children have communicated with a stranger online. These experiences make me very proud to be a Teenangel and I look forward to many more presentations in the future. 1. Go to "My Privacy" which is the last option on the button bar on the left hand of facebook pages. 2. Scroll down until you reach "News Feed and Mini-Feed" and click on the "edit settings" link which is below it. 3. You can read about the feed and also UNCHECK selections to remove information on your mini-feed. 4. When you are finished with this, click "save changes" and you are all set! At first I was extremely nervous. I read over my lines (in the role play) millions of times thinking I would freeze on stage. Though, my anxiousness subsided eventually and I was able to calm down with the help of the Teenangles support group that came along. Walking into the school was a new experience in its self. There were tons of middle-schoolers grouped in circles around the building. Workshops were going on everywhere I turned and a significantly large presentation happening in the auditorium. The women who were heading the day’s events kept coming over to us and thanked us for coming. This made me feel important and very proud. When our time finally arrived to present our cyberbulling slideshows the nerves were eliminated. Instead of stage fright I was filled with excitement and awe at the 900 some odd people that faced me. The first part of the PowerPoint went smoothly. The only technical difficulties we encountered came during “The Game Boy Ploy”; my part!!! Not to worry, my partner and I read through our parts clearly and enthusiastically; even better than I had imagined! I was astonished that we pulled through so well. We received a huge applause and a big thanks from the school. The day, the presentation, the entirety of the experience was one that I am glad I was able to be a part of and one that will be hard to forget. >realize that we weren't telling them not to do it, but to be safe while navigating them. Bringing that reality to them made them think of us more as role models, rather than teen police! >share what we knew with other younger teens who will benefit from it. >I'm really looking forward to continuing my work as a Teenangel.